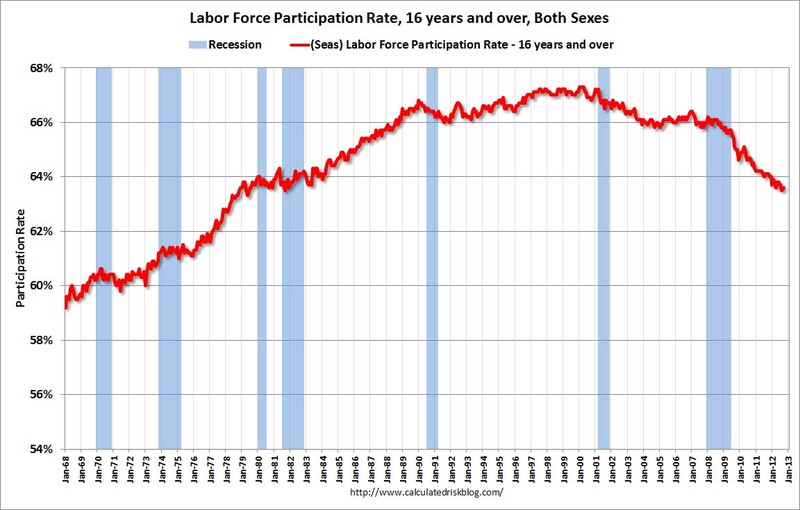 For a more detailed discussion, go to the following post from Calculated Risk (from which the chart below comes): Understanding the Decline in the Participation Rate. There’s much more than I’m offering here, plus a total of five graphs, all of which should be of interest to anyone reading this. On Friday, the Bureau of Labor Statistics released some surprising estimates from the monthly survey of households: the number of Americans who reported working in the last month leaped by almost 900,000, and the percentage of Americans over the age of 16 who reported themselves as either working or looking for work increased. In many months over the last decade, the labor force participation rate fell, so it was welcome news — to a point — to see more robust data. It’s worth adding, however, that the household survey is notoriously noisy month to month. The estimates are subject to large revisions, and the survey is generally considered less reliable than the data from the separate survey of payroll of establishments from which the estimates of job gains or losses are drawn. Despite the gain last month — and even if we see several months of gains — we’re almost certain to see continued declines in the labor force participation rate in the coming years. That decline will not be related to the strength of the economy but to ongoing demographic trends. Take a look at the graph going back 44 years. Note how noisy and choppy the estimates are from month to month. Despite the month to month noisiness of the estimates, recessions clearly led to declines in the participation rate of something less than 1%. The sheer depth of the 2007-2009 recession probably contributed to a larger decline than the other recessions marked here, but it’s unlikely the decline was more than 2%. Note that after some recessions end, the labor force participation rate is still declining — this is in part an obvious result of employment being a lagging indicator of economic conditions. America is an aging country, and older people participate in the labor force in dramatically lower numbers than adults in their 20s through 50s. Even though a higher percentage of older Americans is expected to remain in the labor force in coming decades, the general aging of the population wil continue to bend the curve downward. More young adults are going to college, and more older Americans are returning to school for additional degrees, certificates, and programs. There could be other factors at play, like the number of Americans in a financial position to retire early, the number who live at home with disabilities (institutionalized people are excluded from this survey), and other complex demographic issues. We’re likely to see the labor force participation rate stabilize at its current level (with a lot of noise) or even increase slightly for a period of months or years, but then it’s going to start declining again.